WordPress.com vs WordPress.org: Which is better & Why? 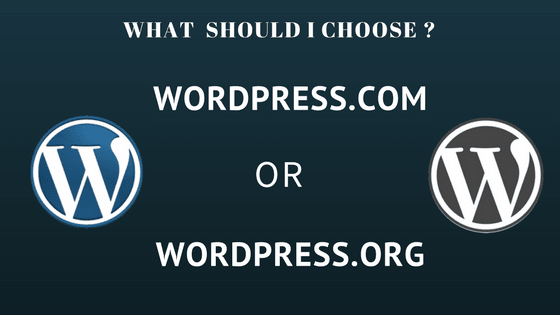 What should I choose – WordPress.com or WordPress.org? Which one is cheaper, WordPress.com or WordPress.org? WordPress.com vs WordPress.org? 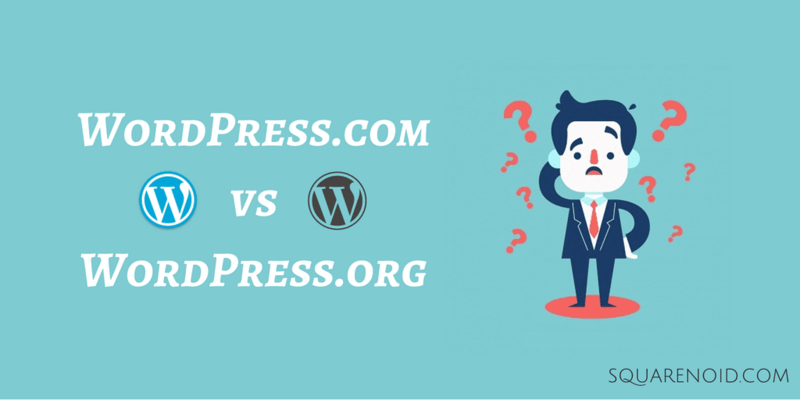 When a blogger chooses to go with WordPress Platform, the first questions to click in mind is this question, whether to go for WordPress.com or WordPress.org. WordPress is the most popular CMS (Content Management System) and the #1 best blogging platform which comprises more than 28% of all website on the internet. That’s huge! It means most of the popular blogs, websites or online stores you see are powered by WordPress. Most of the bloggers (including me) prefer to go for WordPress platform to start their blogging journey. Hosted (or free blogs) WordPress blogs that are often referred to as “WordPress.com” blogs. Self-hosted (Recommended) WordPress blogs that are often referred to as “WordPress.org” blogs. Many of us neglect it by just thinking the only difference in extension. But there are some differences, this post is completely dedicated to listing the differences between WordPress.com vs WordPress.org. So let’s see the differences, pros & cons of WordPress.com & WordPress.org. WordPress.com: You will be able to select a sub-domain. WordPress.org: You can get your own domain address. WordPress.com: Your blog is hosted on the WordPress itself. WordPress.org: You can host your blog on any other Hosting site. WordPress.com: You cannot get the full access to the plugins. WordPress.org: You can get thousands of free plugins. WordPress.com: You can choose limited themes. (Very few with free subscription). WordPress.org: You can choose thousand of free themes. WordPress.com: Your articles are not yours. WordPress.org: You own your articles. So you won’t have any difficulties in earning money. 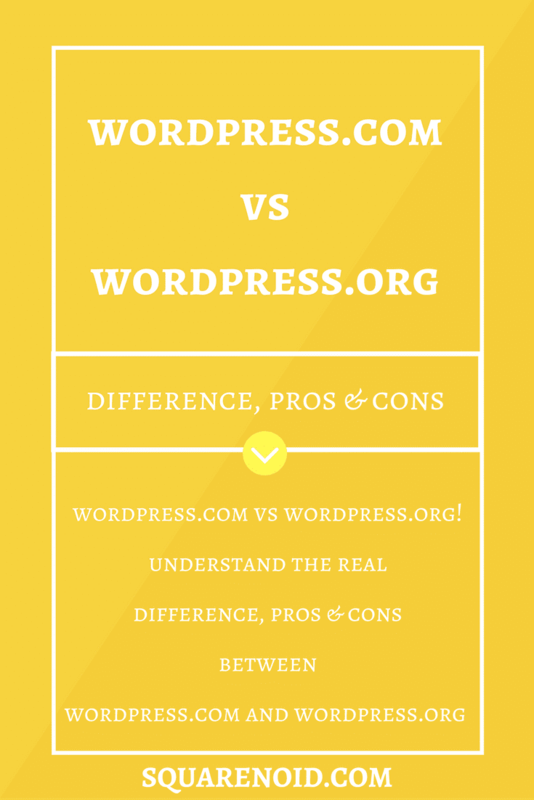 So, till now you have a little bit idea about the difference between WordPress.com vs WordPress.org, below is the explanation of each difference. In the case of WordPress.com, after you sign-up for a blog. You will be given a sub-domain like yoursite.wordpress.com. This domain name is free. It is offered by the WordPress only. 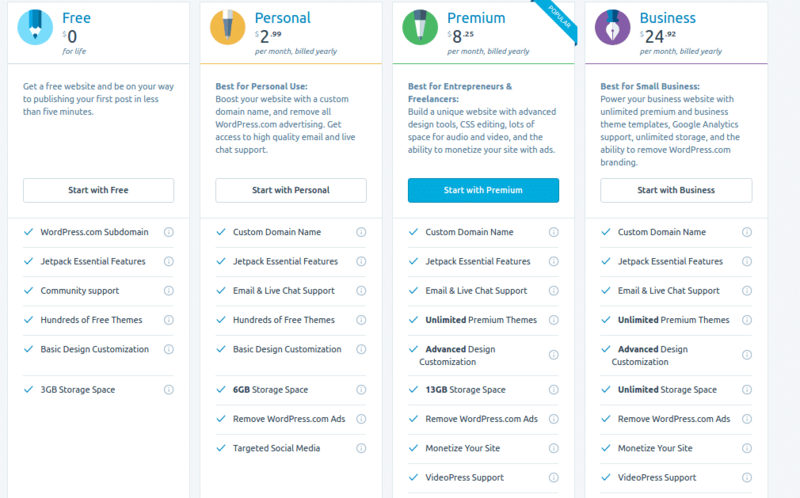 If you want a specific domain name without any further extension, then you have to upgrade to a premium plan (which is $99 per year). Then it won’t be free anymore. You have paid for the domain name. In the case of WordPress.org, you definitely have to purchase a domain name from the domain registration websites like Bluehost, Hostgator. In every domain name registration site, they have their own plans. With these sites, you will have your own custom domain name, like yoursite.com. Isn’t it sound good. Still Confused? You can read What is Domain Name and Web Hosting in more detail. Click Here, to Purchase a Hosting from the Bluehost and get a free domain name. In the case of WordPress.com, you will be given a web hosting space of 3 GB. This 3 GB space is on the free blog. If you are not satisfied with that space then you can extend the space by selecting other plans according to your choice. These plans won’t be free. You can see the price which is given below in the image. In the case of WordPress.org, you have to purchase a hosting from the hosting registration sites like Bluehost, GoDaddy, Hostgator, Siteground. As WordPress.org is a self-hosted CMS, so when you are using WordPress.org platform you have to host your site by purchasing a hosting. The price varies with different plans. The image below will give you an idea of hosting plans. 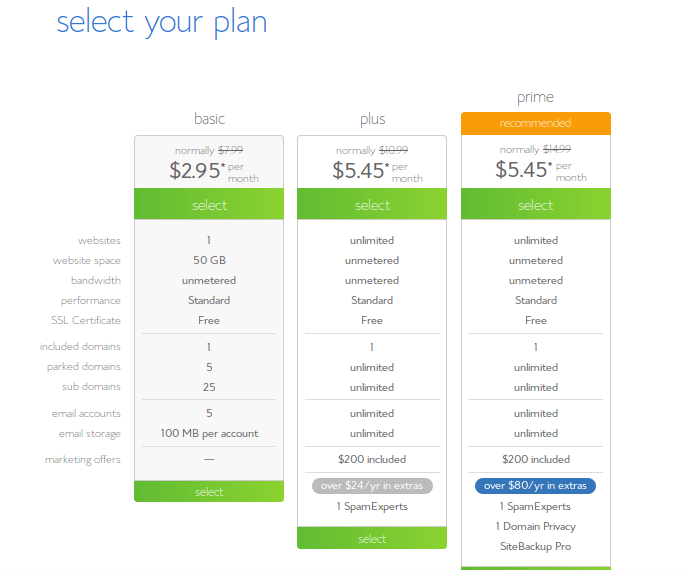 It is the hosting plans for Bluehost. You will get a free domain name. That means you are saving some bucks. Want to Choose the BEST WordPress Hosting service? Then read this → How to Choose best WordPress Hosting, we have mentioned the top companies on the list which provide the best WordPress Hosting. You can also read our Bluehost Review and SiteGround Review. In WordPress.com you won’t be able to access the plugins free of costs. If you want to get the plugins to your site then you have to get the premium subscription. For premium subscription, you have to spend bucks approx $99 per annum. WordPress.com doesn’t allow you to install any third party application. In the case of WordPress.org, as it is self-hosted you will get thousands of free plugins. You also can create your own plugin and install it to your site (in case you know the coding). If you want to get more plugins which are not free then you have pay for the plugins only. You don’t have to pay for any further plans. In WordPress.com you will get a few limited themes to choose from. Also, you will be able to customize your blog to a limited condition. You cannot use or upload any third party themes to your blog. If you want to apply an optimized theme then you have to purchase the premium plan. With the premium plan, you will be able to get the SEO optimized themes. Also, you may have to pay for the themes, if they are paid themes. In WordPress.org, you will find the huge list of free themes and you can easily install them to your blog. You can purchase the best WordPress premium themes according to their prices and you don’t have to pay the extra charges for any plans. You can create your own themes, edit the existing themes with the help of coding (HTML, CSS, PHP). As WordPress.org is a self-hosted CMS you will be able to access the source code of the installed themes and can edit it with ease. In WordPress.com, it doesn’t allow you to display any ads on your site. If you want to make money through blogging then ads play a major role in earning. However WordPress.com itself displays their own ads on your site, that means they are getting the profit. That’s why I have written that your posts are not yours now, WordPress.com is using your posts increase their visitors and also to earn their profit. Only users with high traffic websites (25,000 monthly page views) can apply for advertising with revenue sharing. In WordPress.org, you own your posts. Whenever you publish anything, those posts are your assets. Here you can display ads and earn money. You can apply for Google AdSense program where Google will provide the ads to display on your site and also pays you. You can monetize your blog any way you want. What is the purpose that I am making the blog or website? How much time do I want to spend on my blog or website? If you are a newbie and want to get a knowledge in blogging field then you can go for WordPress.com as it is free, simple and it takes care of most of the things for your website. If you want to create a free blog on WordPress.com, then you need this path to follow → How to start a Free Blog on WordPress. Or if you want to be more technical and want your site to be a customized one then you should try WordPress.org. Here you will learn more about the functions of plugins how the domain and hosting sites work. You want a personal website, in which you want to share your personal experiences or stories. You don’t have the time to customize your blog and you want your blog to be simple. Then you can try WordPress.com. Here WordPress.com will take care of your data, they will take a back-up of your site regularly. If you want to earn money through blogging and want your site to be like your own customized one, then you should definitely go for WordPress.org. As WordPress.org is self-hosted, you can display the ads and get paid. You can try more methods of earning. If you want your site to be very simple and doesn’t want to apply any extra customized items then the free WordPress.com is for you. But if you want any customization to your site, like you want any premium theme or want to any plugin. Then you have to pay the premium charge which is $99 per annum. On the other hand for the WordPress.org you have to pay for hosting and domain name at a basic level. To purchase that the approximate cost you have to pay is about $50/year. So you are saving approximately 50% from the premium WordPress.com and also you can earn money. WordPress.com will share your posts to gain the visitors. – – You have to work hard to gain the visitors to your blog through social media. – You can customize to a limited condition. You don’t have to take care of the security and back-up. (WordPress.com engineers will make sure about that) – – You have to take care of the security and the back-up. – You cannot earn money through Adsense. – Your posts are not yours. So these were the differences, Pros, and Cons between WordPress.com vs WordPress.org. 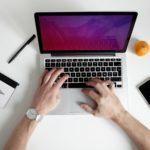 For people like me who want to learn the technical side and want to have the full control of the blog of their own will prefer the WordPress.org. But in case you want a free blog and making the blog just for fun then go for the WordPress.com. Below there is an infographic, where you can see the difference in an easy way. Share the info-graph with your friends or in the social media, so that most of them will get to know the difference. If you decide to start with a Free WordPress.com Blog and later on want to shift to WordPress.org (self-hosted) you can easily do that, here’s a step by step guide on How to Transfer your blog from WordPress.com to WordPress.org. I hope after reading this post you’ve clarified your doubts about the differences between WordPress.com vs WordPress.org. If you have any queries, feel free to ask in the comment section below.